It would seem that there a lot of sweet toothers out there. Requests have come in for Gypsy Tart, apparantly featured on UK TV recently, which many of you would like to try but did not catch the actual recipe. 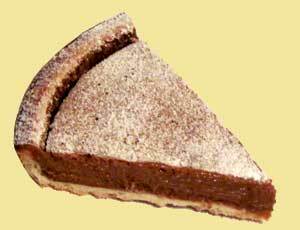 Gypsy Tart only requires three ingredients you can easily pick up from your local supermarket. You can pick up a pre-cooked pastry case so easily these days, or pre-rolled sweet / sugar pastry that you just need to line and bake yourself. If you would like to be the master of your own fate though and make your own from scratch see my sweet pastry recipe and tips on blind baking. 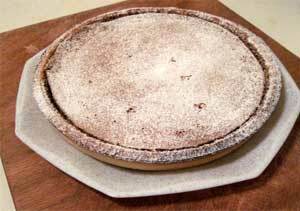 My recipe for Gypsy Tart calls for Muscovado sugar; which is also called Barbados or moist sugar. It is a British speciality brown sugar, that is very dark brown and has a particularly strong molasses flavour. The crystals are slightly coarser and stickier in texture than "regular" brown sugar. Normally available as either light or dark brown muscovado sugar; the darker the colour is, the more molasses and therefore the stronger the flavour. If it is too expensive or if you can't get muscovado, use a good quality dark brown sugar instead. As Gypsy Tart is very sweet, I strongly suggest serving it with some 'tart' fruits to counter balance the sweetness and if you are serving cream, leave it plain or better still try plain, unsweetened yoghurt. Remember when baking anything, ovens must always be pre-heated to allow the foods to start their magical cooking journey straight away. Enjoy your Gypsy Tart and bon appetit . . .